In a previous blog post, we showed you how to install Kubernetes on CentOS 7. Since then, there’s been a number of changes and we’ve seen the first production-ready release. The “minion” term has been changed to “node” and thousands of bug fixes and new features introduced. In this blog post, we’re going to play with Kubernetes application clustering and pods. We’ll use Wordpress as the application, with a single MySQL server. We will also have HAProxy and Keepalived to provide simple packet forwarding (for external network) with high availability capability. We assume a Kubernetes master and three Kubernetes nodes are already deployed on CentOS 7 using instructions described in our previous blog post. In order to achieve application clustering, we have to setup a persistent disk. This to ensure that all respective pods (which could be running on different minions) can access the same data. For bare-metal and on-premises deployment, we have several choices: NFS, GlusterFS or iSCSI. In this example, we are going to setup a simple NFS mount for the Kubernetes volume. Note that we are running on Kubernetes v1.0.0-290-gb2dafdaef5acea, so the instructions described in this blog are applicable to that version. Steps in this section should be performed on storage server. Steps in this section should be performed on all Kubernetes nodes (master and minions). Steps in this section should be performed on Kubernetes master (or Kubernete client via kubectl). The steps in this section should be performed on the Kubernetes master (or Kubernete client via kubectl). Now we are ready to deploy our application cluster. The IP address for the mysql service must match the clusterIP defined inside mysql-service.yaml. We are going to use that IP address as MySQL host for the Wordpress pods as described in the next section. This service IP address is not routable outside of the Kubernetes cluster. 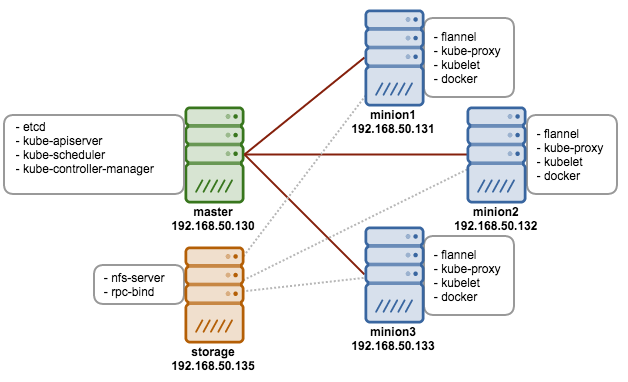 So, our next step is to setup an HAProxy on some of the Kubernetes nodes (in this case, we chose minion1 and minion3) for simple packet forwarding to Kubernetes service IP address. Steps in this section should be performed on Kubernetes minion1 and minion3. Load balancing to the pods will be done internally by Kubernetes via services, not via HAProxy since we just defined a single backend host, which is the Kubernetes service IP address. HAProxy is just a reverse proxy to access Kubernetes service network which is not routable outside. The last part would be setting up virtual IP address, 192.168.50.100 for high availability so it floats between two load balancers and eliminates any single point of failure if one of the load balancers (also a minion in this setup) goes down. The following steps should be performed on minion1 and minion3 unless specified otherwise. Sep  2 18:38:16 kube-node3 Keepalived_healthcheckers: Opening file '/etc/keepalived/keepalived.conf'. Sep  2 18:38:18 kube-node3 Keepalived_vrrp: VRRP_Instance(VI_1) setting protocol VIPs. Sep  2 18:39:18 kube-node1 Keepalived_vrrp: Opening file '/etc/keepalived/keepalived.conf'. Now we are all set. We can setup the Wordpress application and access it via virtual IP address, http://192.168.50.100/ . Follow the installation wizard until the end and you’ll have Wordpress ready and running in high availability setup. If one of the minions goes down, Kubernetes will automatically fire up a new container to match the replication controller definition. In this case, we defined our Wordpress application to run in three replicas. The pod (container) allocation is dynamic and automatically provisioned by Kubernetes. User can access the pod via Kubernetes service address transparently, without knowing the actual location of the pod. Deploy a Galera Cluster inside Kubernetes as the MySQL backend, as mentioned in this blog post.